This site is graphic intensive. Please be patient while the images load. 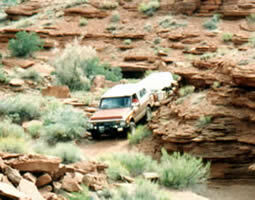 UPDATE ~ As of January 2005, the Canyon Climbers will be on an extended hiatus. The Club has dissolved its funds, all meetings have been cancelled and new members are not being accepted. Due to personal issues, lack of commitment, and conflicting schedules we have decided to disband the club for the time being. Please email the webmistress if you have any questions. Welcome to the 4 Corners Canyon Climbers Home page. 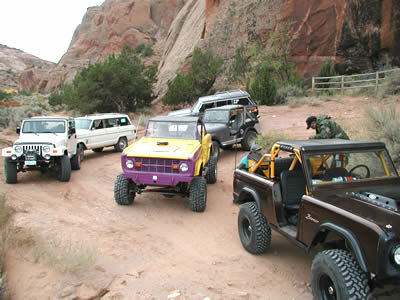 We are a diverse group of four wheelers located in Cortez, Colorado. 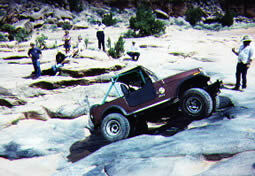 The Canyon Climbers are a family oriented organization dedicated to four wheeling, community service and keeping the back country open for use by everyone. We are a group of people brought together by our love of four wheeling. Our vehicles range from bone stock to outrageously modified. 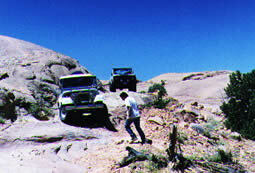 Our local trails are very challenging and we often travel to Moab, UT, and Farmington, NM. to test ourselves and our rigs on other trails. We are also motivated by our desire to keep our public lands open to all user groups. Many of our members are involved in other aspects of public land use such as horseback riding, ATV-ing, mountain biking, hunting, ranching, search and rescue, archeology, hiking and camping. We, as a group, are very concerned about our public land privileges being taken away from us. As a group we stand united against the reduction of our public lands. And together with other groups of concerned public land users we are making our voices heard in SW Colorado. But don't get us wrong - our first love is our four-wheel drive vehicles, taking them responsibly off road, and enjoying four wheeling. We also take great pride in our community involvement, whether it be a roadside trash pick up, a food drive for the needy, or participation in our community events. But we also realize that if we don't fight for our right to use public lands, we will lose them all together.